My actual Morning Pages journal, almost full! I posted here earlier that I'd started doing Morning Pages. It's been over 30 days now -- 36, to be exact -- and I'm still at it. If I am not able to write my three pages in the morning, I write before I sleep. I've almost filled up my notebook, which I don't think I've done since grade school. Before I started doing my Morning Pages, I'd seen a lot of blog posts claiming how the habit changed their writers' lives. I don't think it has changed mine in a big way yet, but I'm already noticing small differences. I believe I've already mentioned here that I've been dealing with some anxiety. It's not debilitating and I don't get panic attacks or anything like that, but the level of anxiety I experience at times takes a lot of my energy and hinders creativity. I worry about big things, too, like the Great Pacific garbage patch or Taal Volcano's next eruption or where this country is headed with our current leaders, and if I'm not careful, that worry could take over the rest of my day. I've taken some steps towards reducing this anxiety: I've unsubscribed to all sources of news (that way, when I do decide to update myself on current events, I'm prepared) and I no longer check my Facebook. There are other things to be done: sleep early, avoid coffee, start a meditation practice, get active, etc., but doing my Morning Pages has already helped me manage my anxiety. I've noticed that when I am feeling particularly anxious about something I'm not ready to face, I delay writing in my Morning Pages journal because I know that I would be writing about the very thing I'm avoiding. Thankfully, the last month has taught me that writing about my concerns and fears help center me and clear my mind. Another thing I've learned is that the way I talk to myself is sometimes terrible! Morning Pages are supposed to be your uncensored thoughts and I've noticed that I keep saying "I should be _____" or "My life should be ______." That's the root of a lot of frustration! In some of my Morning Pages, I write to myself and I've been teaching myself kinder and more appreciative self-talk. 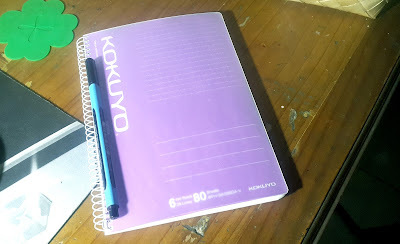 Finally, I've written down a lot of ideas -- for my goals, for my blog, for short stories, for what to do next. Morning Pages are not supposed to be treated like a journal; it's not even suggested that you read past entries, but I'm pretty sure my notebook is already home to a lot of creativity. That's my latest update. I'll continue this habit and let's see where I am in six months or so. If you'd like to do Morning Pages as well (I recommend it!) here's how, according to Julia Cameron. It's not high art!